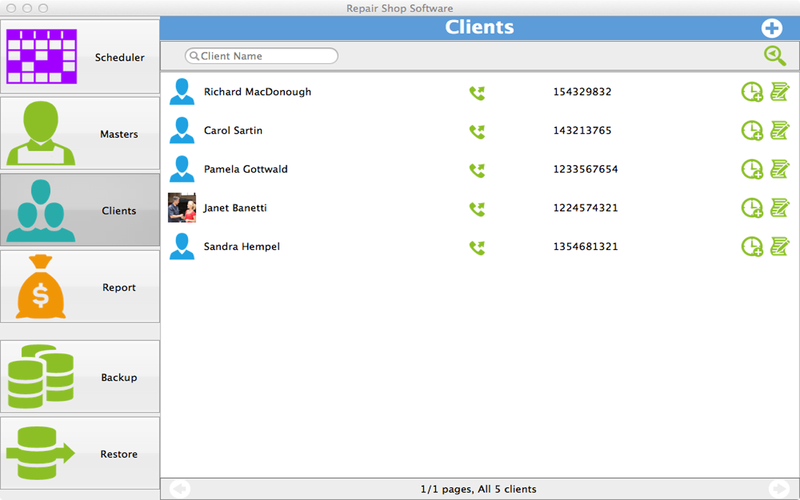 Repair Shop Software is a very useful, efficiency inducing program for all repair related services of any kind. Designed specifically to be used on Mac (OS X), repair shops such as vehicle repairing, shoe or cloth services (dry cleaners, shoemaker, etc) and equipment repairs can all be managed effectively. The software can plan all working hours of technicians, store in all information about the jobs performed, clients served and any special comment or consideration that is required for a particular job. The program is equally efficient to be used by a single technician or a whole repair services shop or factory. The repair shop software offers an easy to use, simple user interface allowing it to be easily used and operated by anyone. 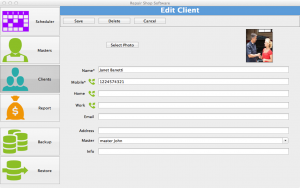 The Main menu consists of five icons namely, Masters, Clients, Reports, Scheduler and Backup/Restore Options. The Masters section holds in all information about the different technicians that perform repair jobs. This includes their specializations, contact and appointment details. 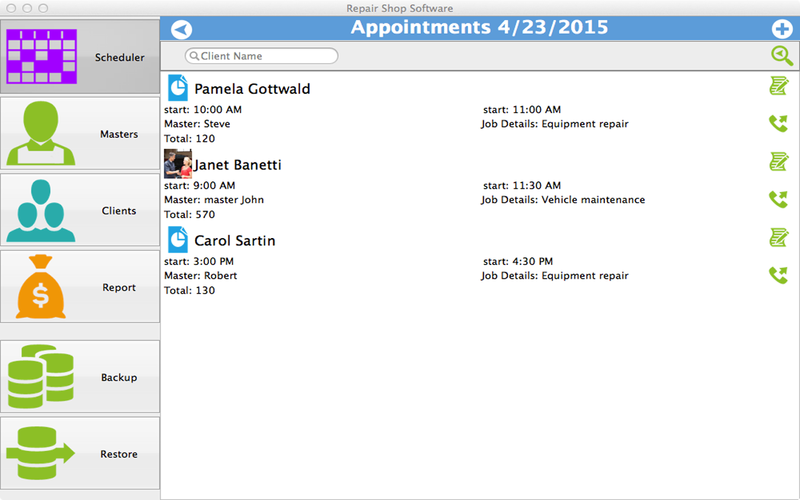 Viewing this information, new appointments can be fixed easily through checking availability of different workers. The Clients section similarly holds in all information about the clients that are currently being handled along with the ones that have been served before. All contact details and personal information of the clients including name, address and phone numbers are saved in the program along with any special notes related to services. These notes can be consulted whenever required. In addition to the option of making direct phone calls to clients and masters, the program also allows directly contacting clients on their Skype ID besides capturing photos of clients and masters to be saved with their profiles. The Reports section offers a complete breakdown of all financial earning per job performed. For detailed financial analysis, users can check this section. 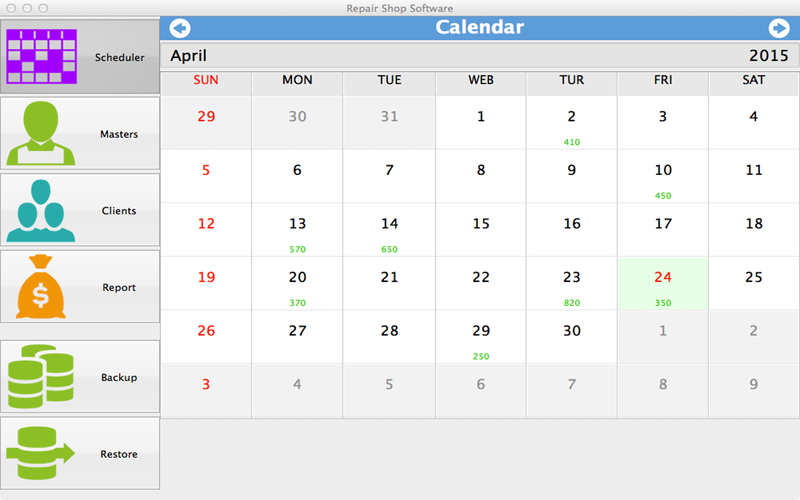 The Scheduler is another feature where you can comprehensively go through a lot of saved details. 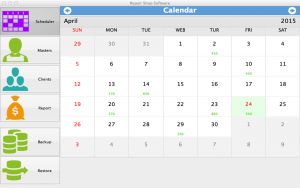 It appears in form of a calendar where accumulated daily earnings are shown on every date panel. By clicking the respective date, a comprehensive and detailed analysis is presented including the job performed on that date, which technician performed it and how much did the job earn. 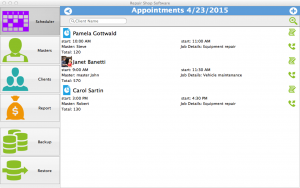 Also through flipping the calendar new appointments can be fixed based on availability, whereas earlier appointments can also be referred to. Lastly the Backup/Restore Option allows users to make the program compatible with other devices including Windows and Android. This feature not only makes the software compatible over various different devices, but also serves as a backup plan for all your precious data saved. To make the program compatible, users require installing relevant programs from respective stores.